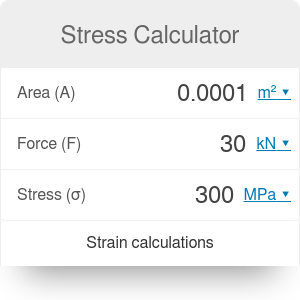 This stress calculator will help you solve the problems in mechanics involving stress, strain and Young's modulus. In a few simple steps, you will learn the stress vs strain relationship for any material that remains elastic. We will also teach you how to calculate strain and how to apply the stress equation. Strain is defined as the measure of deformation - a proportion between the change of length and original length of an object. For example, if you take an elastic band and stretch it so that it is twice longer than initially, then the strain will be equal to 1 (100%). The formula for strain is ε = ΔL/L₁ = (L₂ - L₁)/L₁. L₁ denotes the initial length, L₂ - the final length, and ΔL is the change in length. Note that strain is dimensionless. Stress, on the other hand, is the measure of pressure that the particles of a material exert on each other. It is defined as force acting on the object per area. It is different from the pressure, though; when calculating stress, the area considered must be so small that the analyzed particles are assumed to be homogeneous. If we take into account a bigger area, the calculated stress is usually the average value. The stress equation is σ = F/A. F denotes the force acting on a body and A denotes the area. Units of stress are the same as units of pressure - Pascals (symbol: Pa) or Newtons per squared meter. E is the modulus of elasticity, or the Young's modulus. It is a material constant, different for each substance. What exactly is a linear elastic behavior of a material? If we apply stress to a material, strain increases proportionally. This may be true for some range of stress only - after we reach a certain value, the material may break or yield. Yielding is the increase of strain in a constant stress state. Let's assume we want to find the Young's modulus of steel. To do it, we prepared a steel rod that was pulled with a high force. We decide that the force used to pull the rod will be equal to 30 kN (30 * 10^3 N). We determine the dimensions of the rod. Let's assume the length of 2 m (2000 mm) and a cross-sectional area of 1 cm^2 (1 * 10^(-4) m^2). We observed that the rod elongated by 3 mm. We calculate the strain is the rod according to the formula: ε = ΔL/L₁ = 3/2000 = 0.0015. We calculate the stress, using the stress formula: σ = F/A = 30 * 10^3 / (1 * 10^-4) = 300 * 10^6 = 300 MPa. Finally, we divide the stress by strain to find the Young's modulus of steel: E = σ/ε = 300 * 10^6 / 0.0015 = 200 * 10^9 = 200 GPa. If you are interested in mechanics, try the torque calculator as well. Stress Calculator can be embedded on your website to enrich the content you wrote and make it easier for your visitors to understand your message.